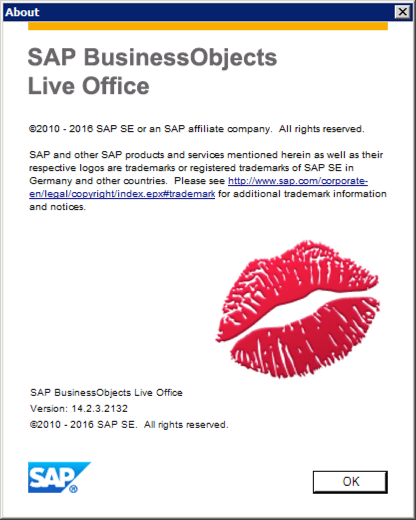 Loving Live Office - EV Technologies, Inc.
A customer recently asked us for a recommendation about using SAP BusinessObjects Live Office. We realized that our last word on the subject was written nearly three years ago. At that time, nobody at SAP could confirm if Live Office had a future. Dashboard developers had already largely abandoned Live Office as a connectivity method, preferring the UNX-based Query Builder in SAP Dashboards 4.0 (see our related article, Live Office is dead to me!). To make matters even more confusing, Microsoft was showing a beta version of its Power BI tool that featured SAP BusinessObjects universe connectivity. Was SAP giving Live Office a future by collaborating with its frequent partner Microsoft? Nobody knew, so I wrote “Nobody Ever Got Promoted for Being Live Office Product Manager“. The situation received clarity in 2014 when Jayne Landry published the blog Run Simple: Convergence of the SAP BusinessObjects BI Product Portfolio. And in 2015, SAP shipped SAP BusinessObjects BI 4.1 Support Pack 6, a substantial upgrade that finally included UNX support for Live Office. So what is the current state of affairs for SAP BusinessObjects Live Office in 2017? It’s future is virtually unchanged from the original 2014 simplification roadmap, which has been slightly altered in 2016. As you can see from the above diagram, SAP is still planning on delivering a single Microsoft Office plug-in for business intelligence. SAP BusinessObjects Analysis for Microsoft Office is already the designated successor for SAP BEx Analyzer. And it recently gained functionality from the previously separate EPM add-in. While SAP BusinessObjects Analysis for Microsoft Office is not yet a replacement for Live Office, it remains so on the product roadmap’s future plans. Which means you can deploy Live Office today with confidence, providing live, trusted data directly into many users favorite BI tool, Microsoft Excel, as well as the other applications in the Microsoft Office suite. Your business users may learn to love Live Office just as much as they love Microsoft Excel. What are your intentions for SAP BusinessObjects Live Office? Pingback: Live Office is dead to me! - EV Technologies, Inc.
Pingback: SAP Continues to Show Love to Live Office - EV Technologies, Inc.